New shoppers experiencing Wall Street Mall for the first time on March 21, 2009. A first glance of the new George Street entrance into Wall Street Mall, 2009. A quick look at the newly built stairwell and ‘the pit’ area being built in Wall Street Mall. A quick glance at contractors working on site at Wall Street Mall. An image of the newly finished pit area, with Life Pharmacy tenancy in the background. 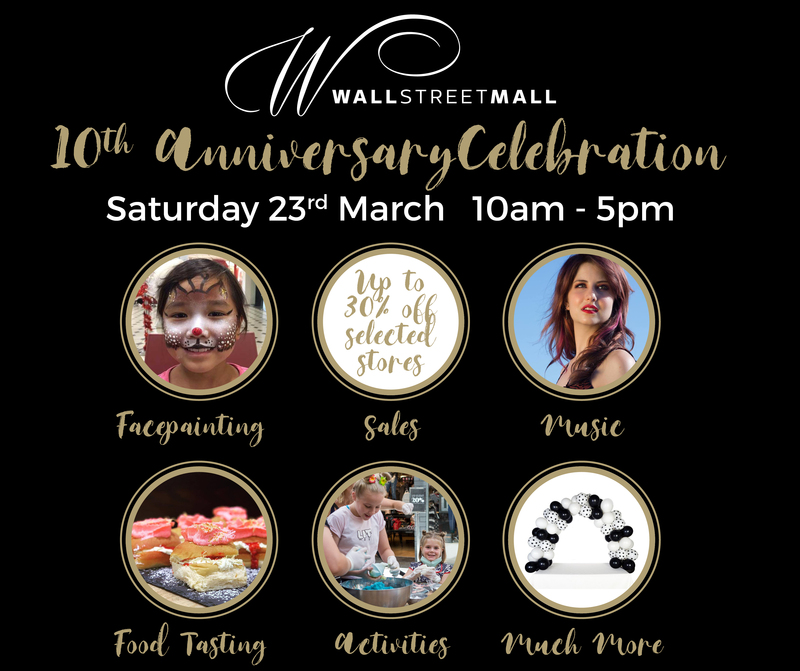 Wall Street Mall is officially turning 10 years old and we want everyone to come and celebrate with us! This Saturday, Wall Street Mall will be celebrating with a day full of live events, interactive activities, and sales/discounts for the avid shopaholic. We will also be having live music, interactive activities such as bath bomb making with Lush, face painting in ‘the pit’, and food tasting throughout the day. Face painting: will be available from 11am - 2 pm, which will be located in 'the pit'. Food tasting: throughout the day we have cheese tasting outside of Marbecks and we have discounted bite sizes pieces for all to try at Watson's Eatery and Artisan French Pastries. Activities: in the afternoon we have Lush putting on a demonstration outside of their store from 2pm - 4pm, for people to make bath bombs. Music: local Dunedin artist Molly Devine will be performing from 12pm - 2pm inside the mall. Much more: Life Pharmacy will be having discounted eye brow shapes between 10am-12pm on Saturday (limited availability), and The Rub will be having $10 head, neck and shoulder massages for 15 minutes all day.